This post was supposed to be more of a well-considered review than the unabashed gushing that was my previous Zelda: Skyward Sword post but now that I’ve beaten the game, I realize that all I want to do is gush about it some more. 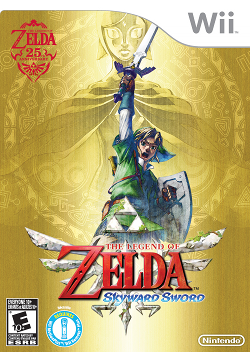 I absolutely loved The Legend of Zelda: Skyward Sword. There are some flaws, there are with every game, but they are tiny, negligible things barely worth mentioning and only worth noting so that they might be cleaned up in the eventual sequel. 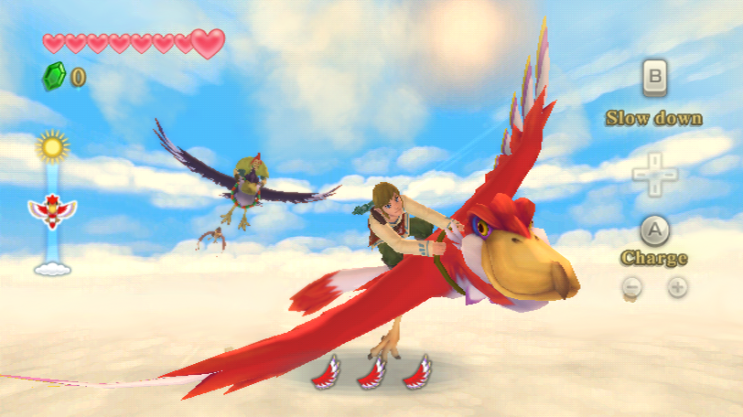 Skyward Sword is exactly what I love about video games. Among the game’s many strengths, perhaps the greatest is that it never forgets that it is a video game. 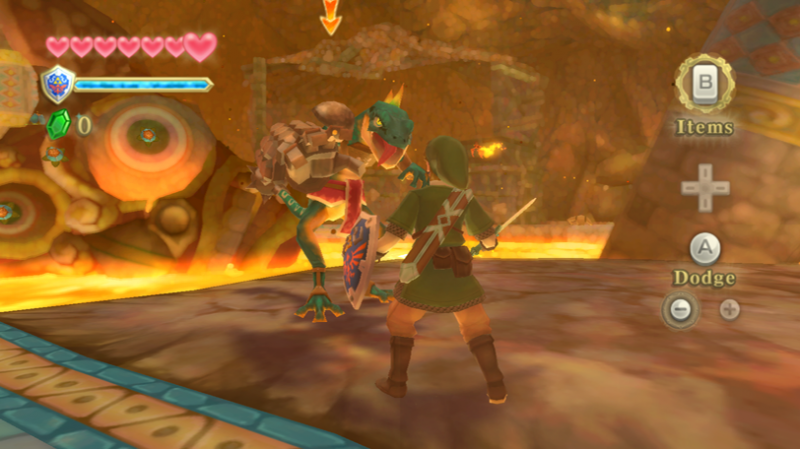 Unlike most of the series 3D entries, Skyward Sword is more closely descended from the original Legend of Zelda, rather than from Ocarina of Time. Ocarina and its ilk, as good as all of those games are, try to make Hyrule seem like a real place. OoT’s Hyrule Field is big and empty, impressive for its time and great hub for that adventure, but ultimately barren. Skyward Sword dispenses with the notion that this is a place that could exist outside of the confines of the game. The areas are no longer one large, connected place, but discreet sections. This may seem a blasphemy to longtime Zelda fans, but what it loses in cohesion, it more than makes up for in playability. Each of the games 3 main overworld areas feels more like a section of Zelda 1’s world that any other game in the series. It isn’t just a path to lead you to the next dungeon, with the odd puzzle and token enemies to deal with. They are intricately designed gauntlets of puzzles and foes that are nearly as meaty as the dungeons themselves. There is a fine attention to detail apparent when you return to each area later in the game, armed with new items and able to discover new shortcuts and areas previously unavailable. While exploring the worlds of previous Zelda’s was fun, they were always empty, even with the number of secrets hidden about. (While something of an exception for Majora’s Mask, that game too was dense.) In Skyward Sword, any time you are on the overworld it is game time. No more running straight through an area, at least not the first time. This makes each section feel as intense and satisfying as the dungeons themselves. The dungeons, the most important part of any Zelda game, are satisfying as well. After the first few simple dungeons, they really expand into true meaty obstacles. They also have some of the best, most innovative designs in the series. The dungeons feature effective use of the item found there, but aren’t wholly reliant on them. There are a few straight dungeons, but there is also an old abandoned pirate ship and dilapidated factory. The best dungeon is probably the Ancient Cistern. There are only two floors, but one represents heaven and the other hell, with completely different challenges on both floors. And the boss is one of the best in the series. Which makes it an anomaly in this game. 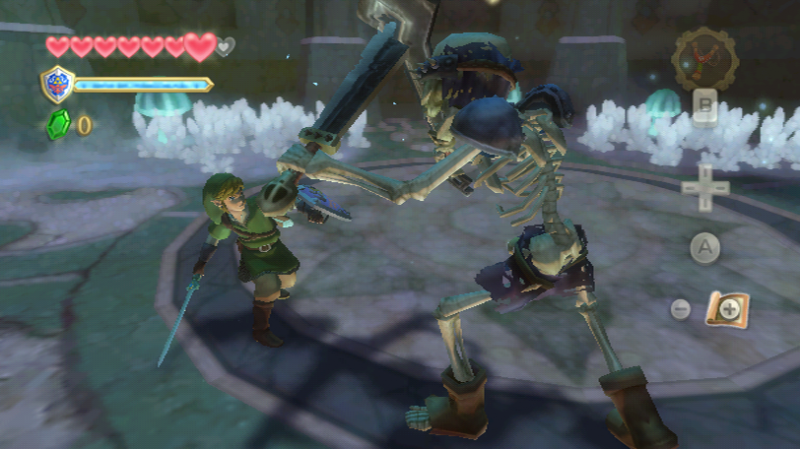 If there is a weakness to Skyward Sword, it is in the boss battles. Several are repeated, several are boring, and one is downright laughable. Many of them are still decent from a gameplay perspective, but their look and how easy it is to beat them make sure they are a disappointment. On the presentation side of things, Skyward Sword also excels. The graphics are some of the best I have seen, no need for qualifications about that being for a Wii game. Regardless of what it lack in technical power, Zelda looks good. The art design covers any deficiencies it might have. The soft, impressionistic backgrounds are magnificent, popping with life in color as it goes from vague dots to full clarity. I wish all games could look this good. The music is amazing as well, which is no surprise. Every Zelda game since the first has sounded wonderful. The story and setting are likewise excellent. It is the usual Link must save Zelda stuff, but it is better told than normal. The first hour or two of the game, which are a bit slow, are used to set up an actual relationship between Link and Zelda. It also sets up the people of Skyloft, who are easily the best incidental characters of the series. Each of the townsfolk is well characterized and feels more real than most games, despite Zelda’s lack of voice acting. With just a word or a grunt, Skyward Sword imbues its characters with more life than games with hours of cut scenes, whether it is Peatrice’s bored grunts or the nervous jittery Fledge. 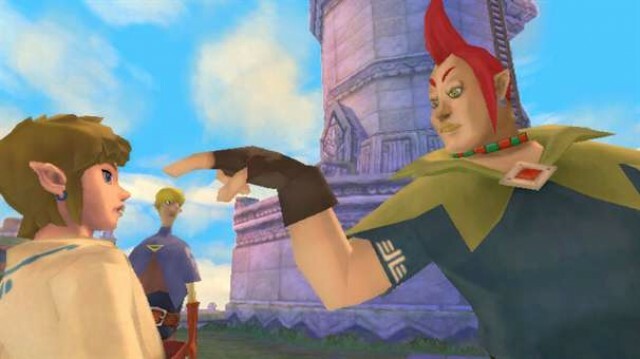 The real star is the buffoonish, bombastic Groose. He starts as the school bully, who has a crush on Zelda and is jealous of Link. Over the course of the game, he develops into one of the greatest ally any Link has had. While the town of Skyloft in not especially big, the characters therein fill it with amazing life. It all comes together into a game, that while not without flaws, is one of the greatest gaming experiences of the year, if not the generation. It shows that Nintendo still is the best at crafting exciting, innovative, lengthy adventures. No one comes close to offering an experience similar to Zelda. I beat this yesterday, and I miss it so much. I just started playing Twilight Princess on the Wii, and the motion seems so sad compared to Skyward Sword. I loved how they used the motion in this game and how you could control the sword so well. This ended up being one of the most fun games to play ever. And I like that Link and Zelda actually have a relationship in this game. Often in other games, they’re pretty much strangers. And while the game felt a little small with the areas not being connected, I do like that there isn’t all that empty space now. Getting from place to place was so boring in some of the previous games. Well, I should cut this short before I ramble too long. Pretty much, I agree with what you said, but I didn’t think the bosses were too bad, but maybe it’s just because the motion makes everything more fun.